Many people think that Linux lacks applications, but they couldn’t be more wrong, especially when it comes to useful apps. 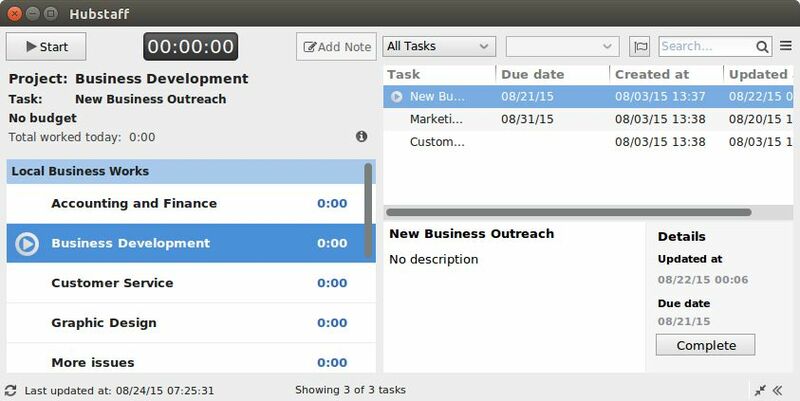 Sometimes, finding Linux time tracking and productivity tools can be a little difficult, so we’ve put together a list of 11 great apps for Linux OS. The productivity tools we’ll be going over are all associated with time management, calendar and scheduling, note-taking, task management and office tools. New Linux users may not realize what a wide variety of tools they have available, simply because they aren’t as well advertised as their Windows and Mac counterparts. The list below focuses on productivity utilities more than the basic office tools such as OpenOffice, KOffice, Gnumeric and AbiWord. 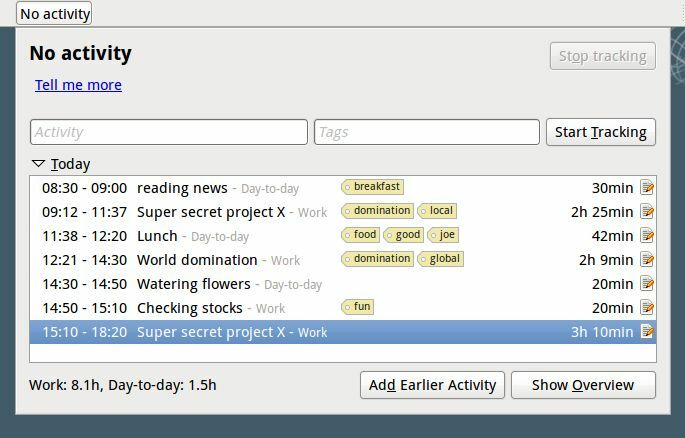 Hubstaff is an easy-to-use Linux time tracking tool that utilizes a desktop app in order to record time. Users simply select the project they are working on and begin the timer. The app will then record various information, such as randomized screenshots (an option that can be turned off), activity time tracker (based on keystrokes and mouse movements as a measure of productivity), applications used and URLs visited. Hubstaff also compiles automatic time reports that can be used for invoicing or internal records, can integrate with multiple project management software and is able to handle employee payroll automatically in the case of companies who employ a virtual workforce. The data Hubstaff collects can be used for many things. The time tracked can be used to calculate payments and activity levels can be used to measure productivity. You can see which projects are taking too much time or over-budget. Screenshots can also be used to ensure a remote worker is truly working on the right project, or they can be used to prove to a client that the work that was billed for is valid. Project Hamster enables easy Linux time tracking with a timer app that allows you to enter your task and begin tracking time to it. Hamster also lets you add and modify times (in case you’ve forgotten to enter time for a project or forgotten to turn Hamster off when tracking an event), and it lets you sort activities into categories. This is particularly useful if you’re tracking time for different clients as a freelancer or if you want to see how much of your time goes to work, play, and so forth. Even better, Hamster produces a detailed report of your time. It will display an overview of your time by day, week or month. Once you have more than a week’s worth of data, Hamster will provide statistics of how you’ve spent your time. This view shows your longest workday, the number of records and will even show a year-long graph of hours by month. Learn more about how to install the Project Hamster time tracker here. Kexi is known as the “Microsoft Access” for Linux, which might be a suitable description if you’ve spent time working with Access. It’s a great tool for managing all sorts of data. 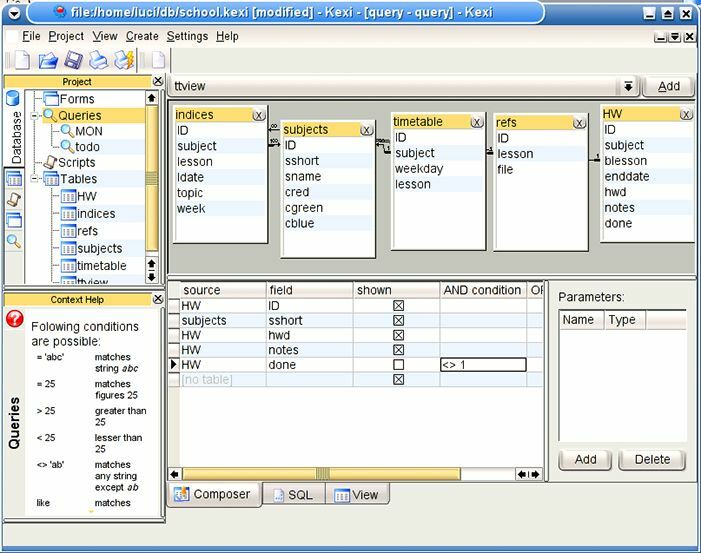 Kexi is an all-in-one application for creating databases, forms for data entry, and entering data and running reports. It will work with SQLite for locally hosted databases, or you can use Kexi in conjunction with MySQL and PostgreSQL databases remotely. It can also import MS Access databases in the .mdb/.mde formats. If needed, you can import Comma Separated Value (CSV) data with Kexi (if you have a data export from one of the many programs that will produce CSV). Kexi can take a little while to get started with if you’re not familiar with designing your own database and forms. But it’s a fairly forgiving program and with a little trial and error you’ll be wondering how you ever got by without it. Most Linux distros should have Kexi packaged in the repos, just check for the “kexi” package. If you write a lot of reports or papers, you need a good tool to keep track of your references and notes. 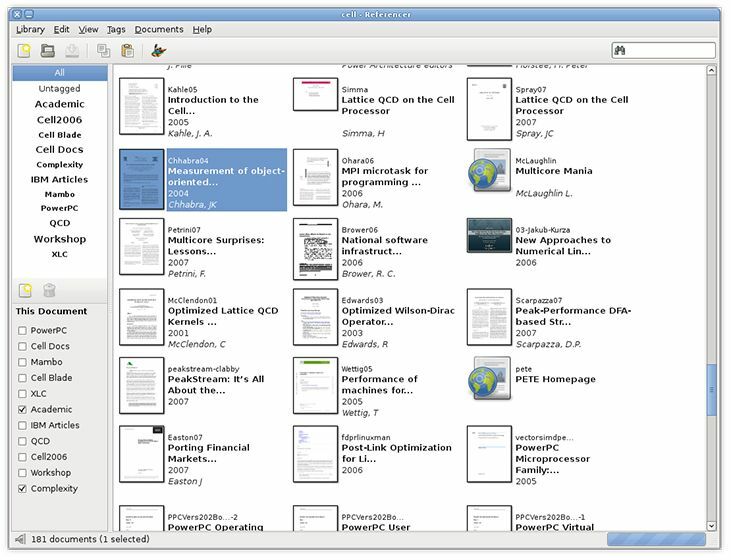 Referencer fits the bill by organizing your documents and references while putting together research. The primary use case for Referencer is for putting together bibliography files in the BibTeX format, but it’s not required. Even if you’re not trying to generate a bibliography, it can be very handy for organizing files and keeping track of notes or other data. But if you are putting together a bibliography, it’s an invaluable tool. If you’re working with PDFs that have the right kind of bibliographic information, Referencer can automatically search for reference info and metadata about the document. If Referencer is not included in your distro by default, you can learn more and download it here. PDFs can be really handy for sharing documents, but the static nature of PDFs limits their usefulness. If you need to trim a document or add pages to a PDF, then you can add those functions with PDF Mod. PDF Mod’s mission in life is very simple: To let users make simple edits to PDFs. Want to drop a few pages from a PDF before sending it on? PDF Mod will let you do that. Want to add a few pages to a PDF? You can do that too. Have a presentation saved as a PDF but want to re-order your slides? Yep, you can swap pages around with PDF Mod. PDF Mod won’t let you annotate or edit a PDF, so if you need to fix a typo on page 15 of a report, you’ll need to have the original source that produced the PDF. But for simple edits, PDF Mod a really useful tool to have handy. Right now PDF Mod is not in the official package repositories for most distros, but you should be able to find packages pretty easily. The PDF Mod page links to packages for openSUSE, Ubuntu, Fedora, and SUSE Linux Enterprise Desktop. Okular is another good tool to have around for working with PDFs and documents. Okular is known as the “universal document viewer,” and it can open almost any file format for documents you may come across. Okular also supports most image types, PDFs, PostScript files, OpenDocument Format text files, TeX DVI files, and many others. In addition to allowing you to view the files, Okular will also allow you to annotate your documents and share reviews with other Okular users. For example, if you have a PDF you need to mark up before something goes to print, Okular allows you to make annotations right on the PDF file instead of having to print it out, add your edits, then scan and send back. Kontact is actually a suite of tools, but for the sake of this article we’ll treat Kontact as a bundle. Kontact is the KDE Personal Information Manager and it acts as a “container” for several KDE productivity tools. This includes KMail, KAddressBook, the KJots notetaker, Akregator feed reader, KOrganizer calendaring app, journal application, and more. You can run some of the Kontact applications separately (KOrganizer includes the calendaring and journaling features) or as an all-in-one productivity powerhouse. 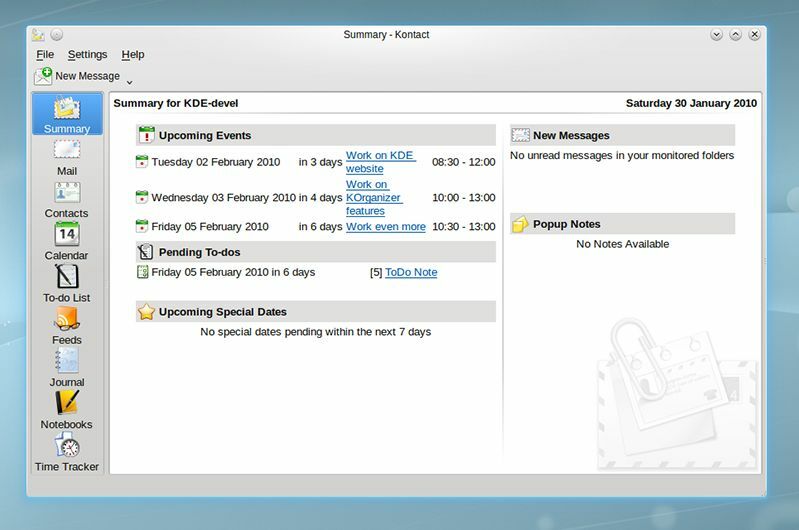 The nice thing about using the Kontact container, though, is that it puts everything in one handy window and provides a summary page that displays your events, to-dos, pop-up notes, and new messages if you’re using KMail. Kontact should be easy to come by with any major Linux distro that features KDE. Just look for the “kontact” package and you’ll be good to go. 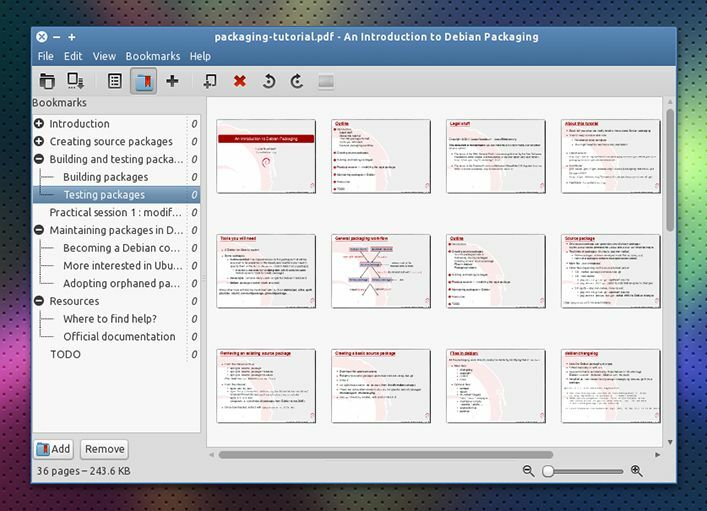 Tomboy is a note-taking application for the Linux desktop that makes managing information much easier. It’s suitable for everything from short notes (“get milk, coffee, and eggs”) to taking notes during meetings, or for project research. 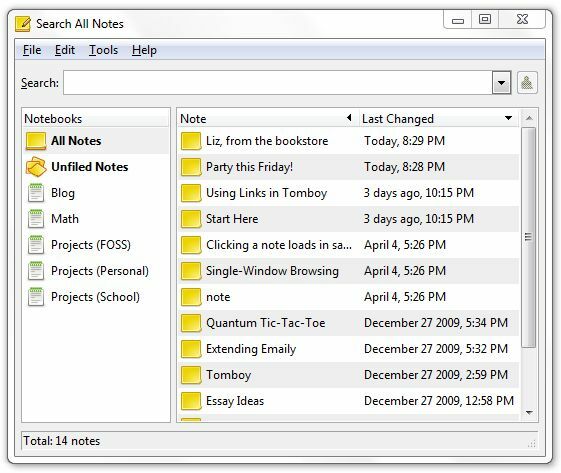 Some note-taking apps just try to replicate sticky notes for the desktop or require a lot of structure to manage notes. Tomboy is as simple or as complex as you want it to be. You can simply jot notes with abandon and use its search features to find what you’re looking for, or you can create notebooks and keep your notes organized by category. Tomboy also goes above and beyond by allowing synchronization, so if you’re using more than one computer it’s easy to keep notes synched across computers. With the right plugins enabled, you can also export notes from Tomboy to HTML, integrate notes with the Evolution mailer and manage links to bugzillas. Most Linux distros should include packages for Tomboy either in the default install or in the package repos. Just look for “tomboy” using your favorite package manager. Most companies assume that users are running Windows or Mac OS X, and it can be hard to find templates for printing labels using Linux. Luckily, there’s gLabels, a utility for printing to all sorts of business card and label sheets. gLabels may not support every type of label and business card sheet you want, but it is quite comprehensive. It supports a wide range of brands, from Avery to Zweckform, and has a number of templates. gLabels offers CD templates, address labels, round labels, and even templates for floppy diskette labels if you happen to have any of those lying around. 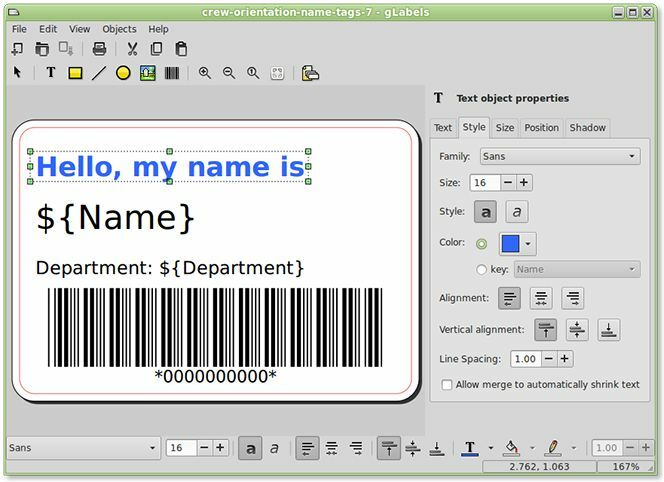 If gLabels doesn’t have the template you want, you can use their Template Designer, which guides users through creating rectangular or round labels, or CD and DVD materials. It takes all the hassle out of trying to replicate a label template in a drawing program, and only requires that you measure the template you want for the size of the labels and the margins on the sheet, and then enter them in the Template Designer dialog. gLabels has been around for quite some time, so you should be able to find it for Ubuntu, Fedora, openSUSE, Debian, etc. 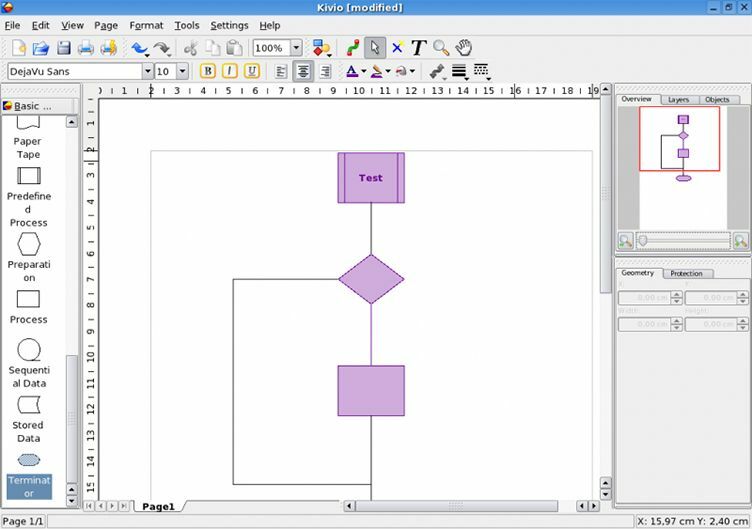 Kivio is one of the best free software applications for creating flowcharts and diagrams. Kivio is a mature and usable flowchart and diagram application that’s simple to get started with and includes quite a few templates. 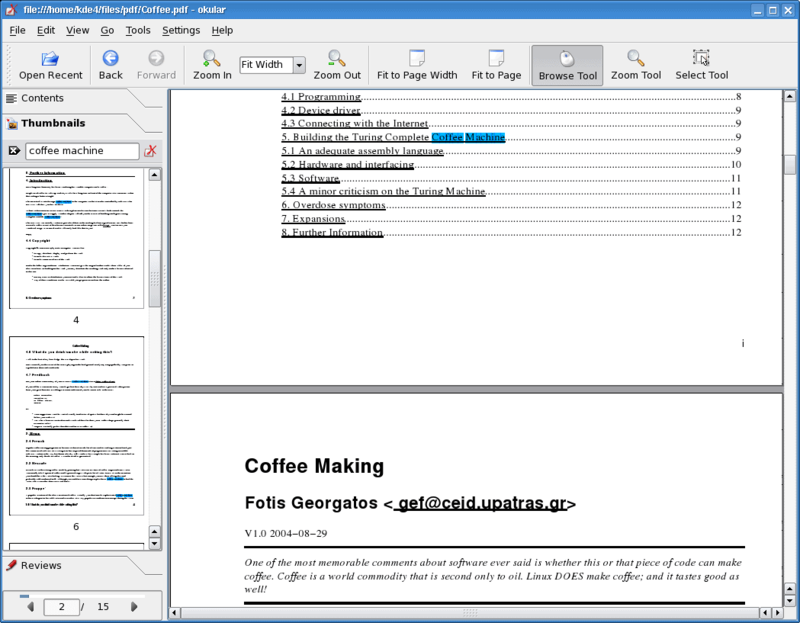 If you’re using KOffice, it should integrate well with those apps to include objects in your documents. If not, Kivio will export to JPEG, PNG, and BMP which should cover any other application that you might want to import charts and diagrams into. As with Kexi and Kontact, Kivio has been around for quite some time and is packaged for all the major distros. For a more detailed look at Kivio, check out Jack Wallen’s recent tutorial here at Linux.com. This is, of course, just a sampling of all the great desktop productivity tools you’ll find for Linux. For example, our own Hubstaff Linux Time Tracking application has a host features and benefits.